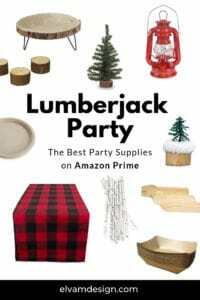 Throwing a lumberjack themed party doesn’t have to be stressful when everything you need is on Amazon, the king of online retailers. 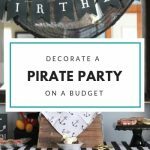 My mission is to make party planning easier and to help you throw a Pinterest-worthy party on a penny-pincher budget, and there are no better deals than Amazon. I’ve curated the best lumberjack party supplies available on Amazon. Forgot a party detail? 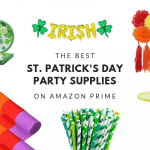 No worries, all of these products are available on Amazon Prime (at the time of this posting). Sit back and start shopping. 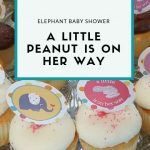 You’ll definitely want to add these items to your shopping cart when you plan your lumberjack birthday, baby shower, wedding shower, Winter party, or whatever the occasion might be. 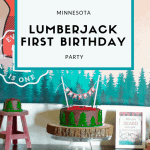 If you’re looking for more inspiration, be sure to check out my Minnesota-themed Lumberjack first birthday party from a couple years back. 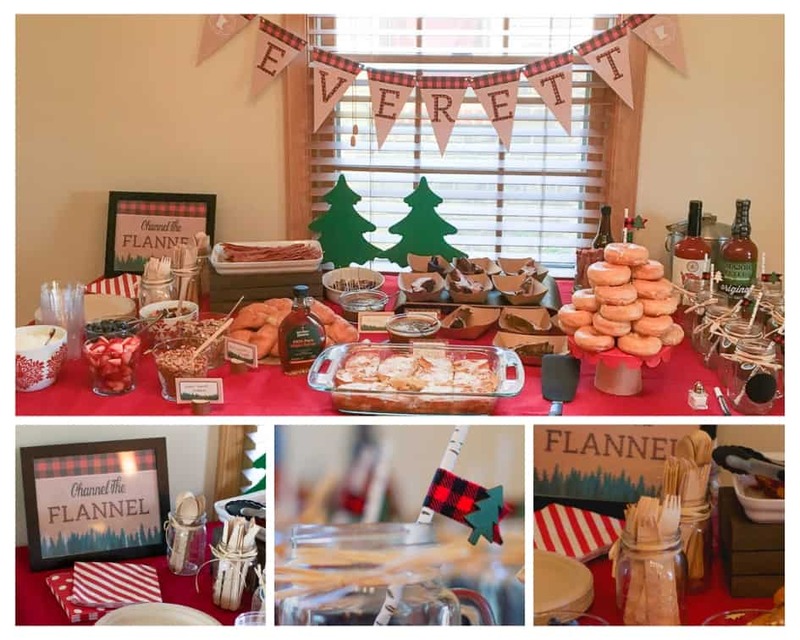 You don’t need a ton of party decorations to put together an awesome lumberjack party. Grab a few decor items and be sure to shop your home. Buffalo check is the ultimate Lumberjack decor item. Pair this table cloth with a simple white linen one, and you are well on your way to having a fantastic dessert or food table. Buy one, or why not make it two? This add-on item is a great buy. Pair this little pine tree with other sizes for an easy way to decorate a dessert table, brunch buffet, or any party space. No party is complete without some sweet treats. 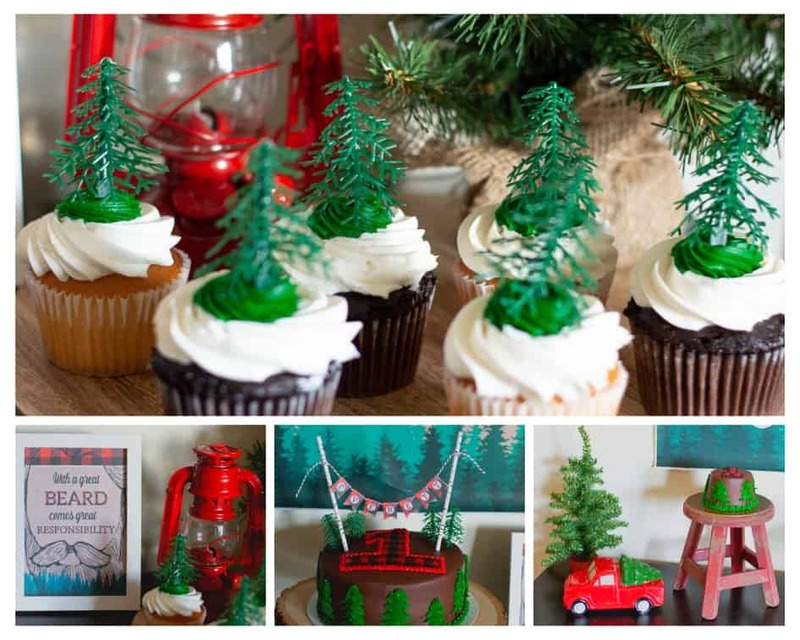 Whether you choose cake or cupcakes, these little trees are the cutest and easiest way to decorate Lumberjack cakes and cupcakes. Comes in a set of 24. Love this cake stand and that it kind of has a mid-century modern look with the metal legs. Get the 11″ size for cakes. These wood place cards are great for displaying food labels or photos of your little lumberjack. There are 4 in each set. Don’t forget that every detail counts and that includes the party supplies, such as plates, cutlery, and other serving ware. I love finding unique pieces that truly fit the theme, so why not get back to nature with these supplies that are friendlier for the environment? Be sure to add this add-on item to your cart. In quantities of 20, 50, or even 125, you’ll be sure to have plenty on hand for all of your hungry party guests. These compostable wooden utensils lend a great vibe to the Lumberjack theme. Grab a larger quantity for future parties and save! These are perfect for serving lumberjack party food. Think ribs, bacon, and wings! Paper straws are much better for the environment. Love these birch ones! 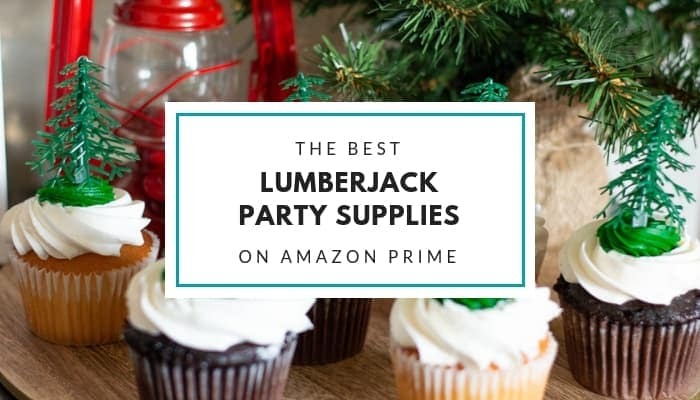 Hope you enjoyed this list of the best Lumberjack party supplies. There are so many fun ways to style them, that no matter what, you are sure to get a unique party look.